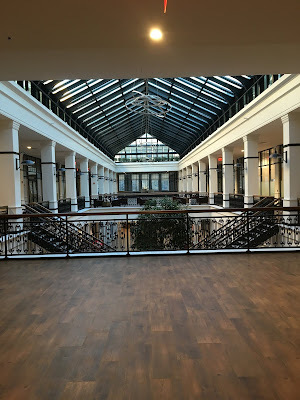 As part of the major revitalization of downtown Newark, the largest city in New Jersey, the hulking Hahne & Company department store building on Broad St was recently completely gutted and repurposed. The 400,000 square foot building opened in 1901 as one of the country's largest department stores, including a spacious atrium in the center of the store, and was part of a small chain of department stores. Hahne's closed by the 1980s or slightly before, and remained vacant until 2013 when a new development was announced for the property. 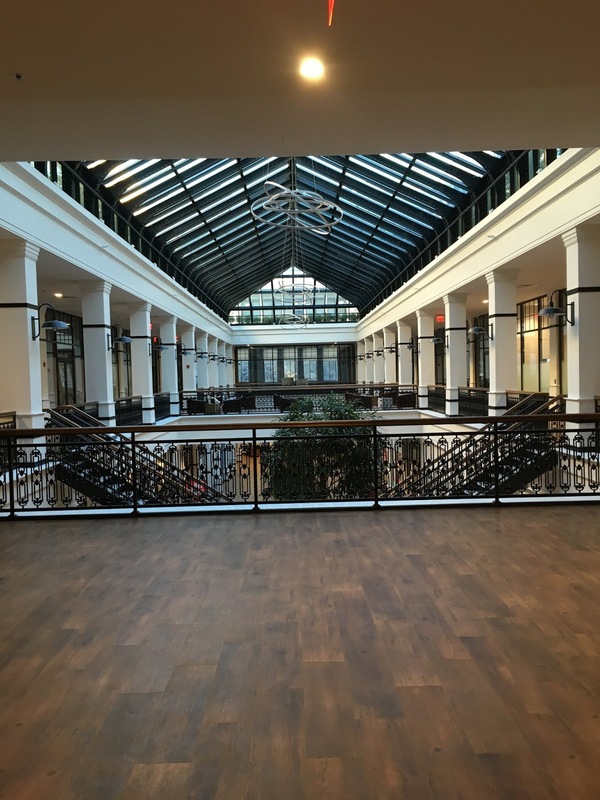 Rather than demolishing the existing structure, the building was meticulously restored and renovated, including residential units on the top floors, offices for Rutgers University Newark, and retail on the ground floor. We're going to begin by taking a look at the building, which is absolutely striking. The entire space, including the atrium, has been beautifully restored. In fact, it was still somewhat in progress when I visited in early 2018. The Whole Foods takes up the front corner of the ground floor. Other retail tenants include Petco, also facing Broad Street in the front, and Marcus B&P, an upscale restaurant. There is a parking garage under the building, which offers free parking for Whole Foods with a minimum purchase of $20 for up to 90 minutes. A glance at Whole Foods' storefront. The Hahne building takes up a full city block. The entrance to the parking garage is accessible from here on New St.
As many urban supermarkets with windows on streets do, this Whole Foods has large-scale graphics covering the windows because the inside of the windows is lined with merchandise. The Hahne name is still very prominent around the building. Let's head in to the atrium/mall area in the center. Whole Foods is on the left side, with Petco to the right and several empty storefronts towards the back. Hopefully they will be filled soon. Here we're looking from the second floor towards the front door on Broad St. Whole Foods is to the right. The mezzanine level is the second level but around the outside of the building, there are more floors. At the time of my visit, the second floor was not yet occupied, although this is part of the space that Rutgers will be moving into. The second-floor (rooftop) patio is also accessible from the mezzanine level. Because the patio does not face Broad St, it was very peaceful up here. Back inside, looking towards Whole Foods again. There is a lot of empty space here (the whole building was deserted), which may change as it hopefully becomes more heavily-used. One more look up at the atrium before we head towards the supermarket. 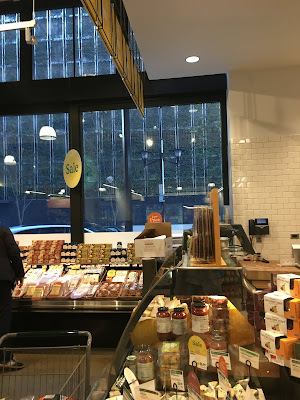 The Whole Foods pictures are a combination of the original set, plus some newer ones I took in late May 2018. Looks like Whole Foods is spilling out into the hallway a little! This makes sense, though, because the supermarket is only about 30,000 square feet. 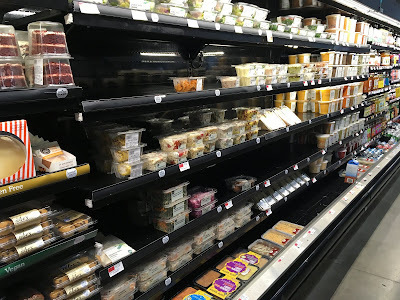 We'll start our tour from this point, beginning with deli/bakery lining this wall, seafood/meat along the back wall, and cheese and produce lining the first aisle. Checkouts run along Broad St, and HABA and customer service are located across from checkouts along the front-end. The aisles actually run parallel to the front wall of the store, which is a little unusual. Here's the same door from immediately inside the supermarket. Whole Foods also has its own elevator to the parking garage. Looking along the front wall of the store towards produce (and the other entrance) on the far side. The mall entrance is right behind me here. Quick look at the small HABA section near the front end. Immediately opposite this section is a beverage/prepared foods/bakery refrigerator case. There's a lot of Newark pride in this store and development, such as this huge brick wall that proclaims, "We Are Newark." I don't know about that. If Whole Foods were so committed to Newark, would they keep the case stocked like this? 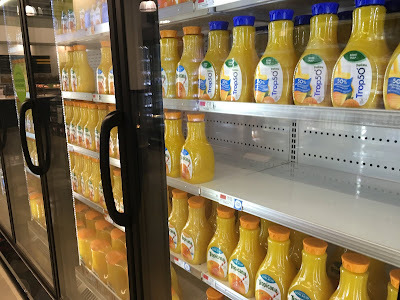 The above photo was taken in May 2018, and shows that the store isn't being kept to the high standards it initially was. Apparently this is a common occurrence. Anyway. Bakery is next along the perimeter. As usual, the breads, rolls, and bagels are and continue to be far superior to most local supermarkets'. This location's bakery section is relatively small, but the store is small. Salad and hot food bars are located in front of the bakery and coffee area. Behind coffee is the deli. 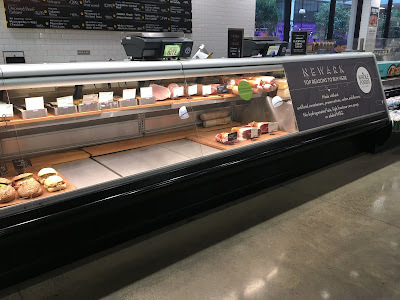 The deli is clearly not a focus for Whole Foods, but this store's deli is particularly limited. Come on, there's almost nothing in this deli! This was at about 12:30 PM on a Saturday, so if there's ever a time to have your deli stocked and running, that would be it. There's also a hot dog bar and another prepared foods counter that isn't coming to be right now, although I don't know that either of those was open, stocked, or staffed during my recent visit. The prepared foods bars, however, have remained fully stocked. The facility is gorgeous, but cavernous and empty (of customers, both visits). It feels like the SuperFresh in Roselle. Soup bar in the back, which is not on an island as it usually is. There are probably kitchens behind this wall. I visited soon after the Amazon takeover, and these signs were advertising it around the store. The seafood section follows the deli-bakery area along the back wall, with the butcher to my left here. 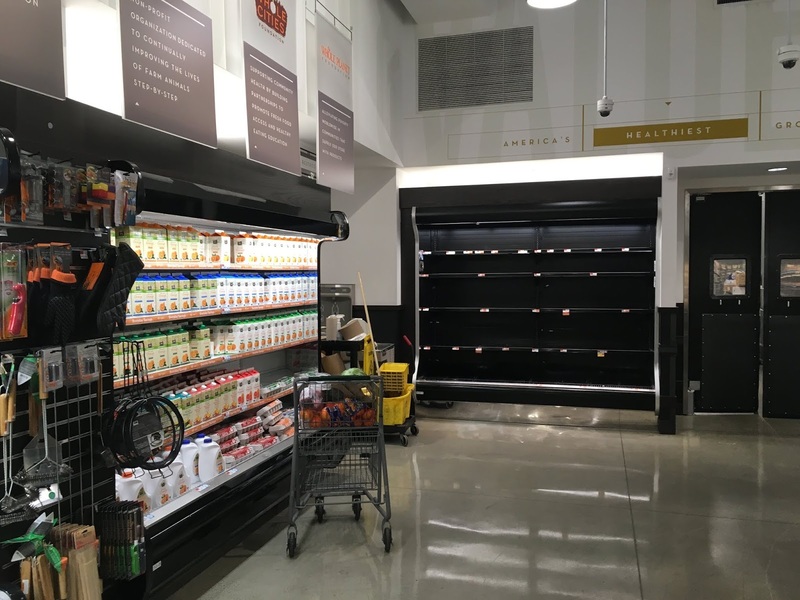 Whole Foods, of course, does still handle this type of issue better than any other supermarket around. But as visible in the first picture (from the first visit), the butcher counter was never fully stocked. Those decals on either side are just space fillers and the case is used for storage from the back. And absolutely nothing in the last case. Come on, we're looking at a Whole Foods here, not an Olive Tree Marketplace! There's no excuse for this consistent, um, inconsistency. 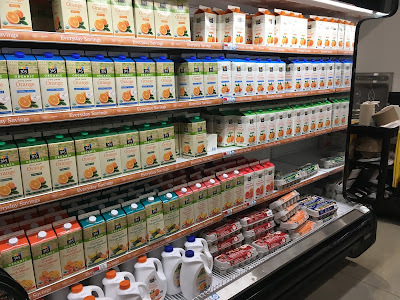 Cheese is located just around the corner from milk. Small, self-service cheese counter. A full cheese counter like many suburban Whole Foods have just wouldn't sell enough here. 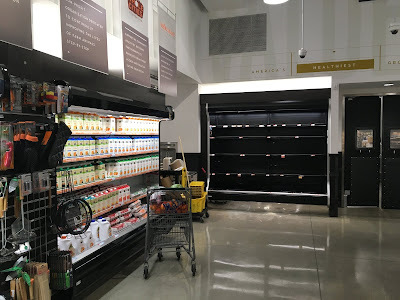 The grocery aisles run parallel to the front of the store, as I mentioned, and are pretty standard, although they're wide for an urban store. Maybe it's just that there's no one in them. 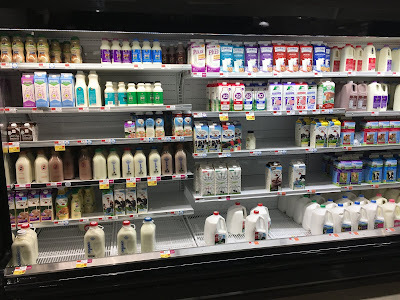 The dairy and frozen aisles are towards the back of the store. The dairy aisle unfortunately doesn't look like that anymore. 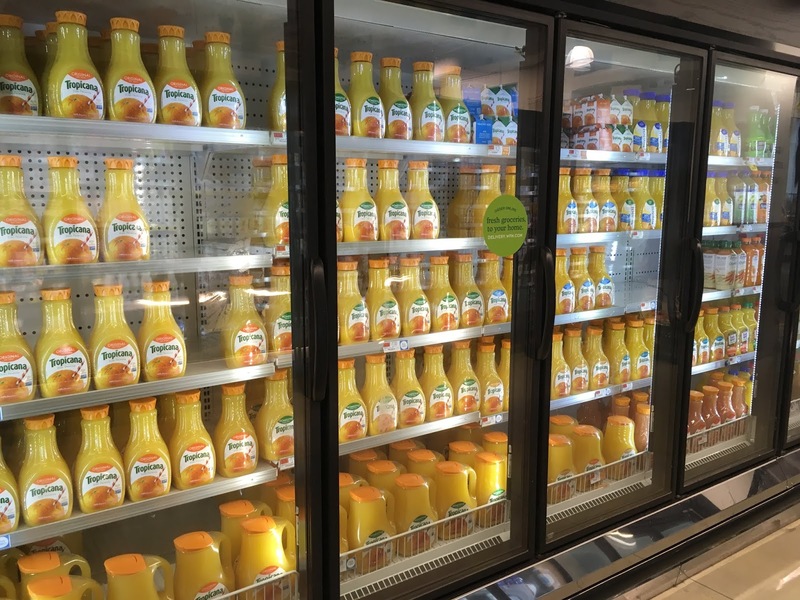 But if you want Tropicana orange juice, you're in luck! No Tree Ripe. No Simply Orange. No Florida's Natural. Oh yeah, and remember, the storebrand is filling space in the egg case around the corner. Just don't take too many. Olive bar back near the cheese counter. A very impressive bulk foods selection separates the cheese and olive area from produce. The produce, however, was great and is great. Luckily, that hasn't changed. Hopefully it won't. The produce department is where the store's architectural interest comes in most obviously. The aisle is spacious and colorful. It definitely makes for a good first impression if you come in the street entrance. Small floral or seasonal section in the front with an informative sign. The entrance is just to the right here. Pretty small front-end, but the store obviously is not very high-volume. There is a seating area on the far side of the registers in addition to the seating in the indoor atrium. This is one of the store's best features. The seating is very pleasant and has a great view of Broad St. However, again, there's way too much space between the registers and the seating. Tightening this area could have made room for more merchandise. This is a mediocre supermarket in an amazing facility. There is a very small selection of almost everything here, but they clearly weren't trying very hard to maximize the sales floor space. I feel bad for the employees who work here, because it's obviously not their fault the deli is almost empty and there's almost no eggs. 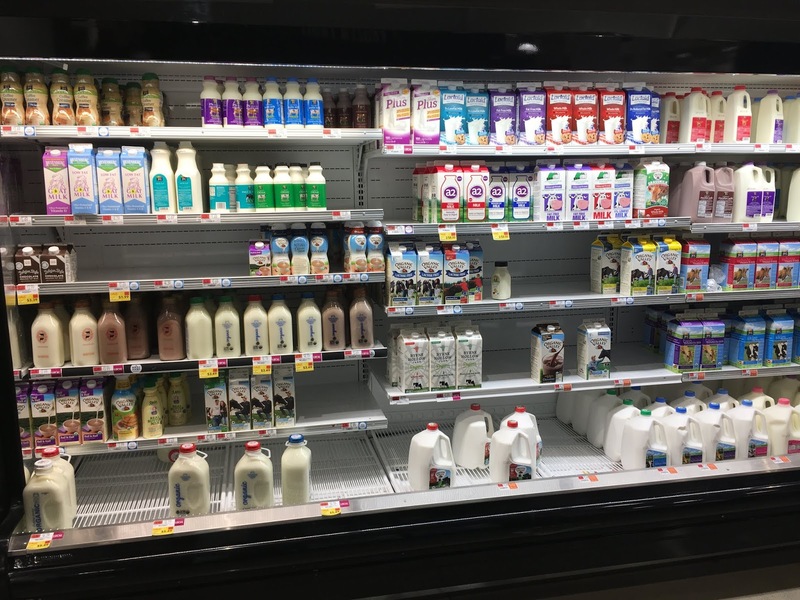 I don't know if this is related to the chainwide supply and distribution issues, or if it's a volume issue at this particular store. Maybe Whole Foods has to grow into the neighborhood, but they don't seem to be putting all that much effort in now. Thank you! Yes, the building is beautiful. The development is still new, so we'll just have to wait and see. You're welcome! Here's to hoping things pick up here!